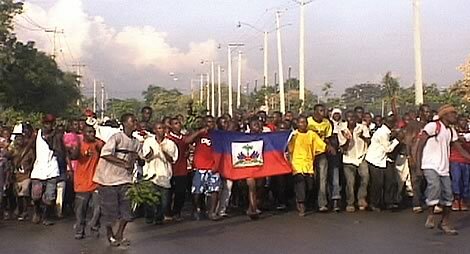 Here’s another great piece written on the current situation in Haiti, by Kali Akuno of Malcolm X Grassroots Movement. According to Milton Friedman and the intellectual gurus of neo-liberalism there are critical timelines and stages that must be strictly adhered by to successfully capitalize on a catastrophe and transform a society. The three month marker is one of these critical timelines, and in the words of Friedman himself “ a new administration has some six to nine months in which to achieve major changes; if it does not seize the opportunity to act decisively during that period, it will not have another such opportunity.” Based on experiences in Iraq, Sri Lanka, and New Orleans over the past ten years several things must be in place at the three-month marker in order for the catastrophe to be fully exploited. These include: sufficient military force to contain the population, the dispersal and fragmentation of the affected population to limit its ability to mobilize resistance, and the legislation and implementation of a new policy regime that seeks to privatize nearly everything and eliminate all financial controls. One of the central enemies of the Haitian people is the guru’s of the ideology of neo-liberalism. These gurus are the neo-liberal theoreticians and policy hacks who control Wall Street, the US Federal Reserve, the Bretton Woods institutions – the IMF, World Bank, and WTO, and most of the central banks of the world since the 1990s. These gurus, most particularly the theoreticians, created a script in the 1970s to exploit catastrophes, natural and human created, not only for material gain but radically regressive social transformation. After waging an incessant ideological war against socialism and communism the theoreticians won critical support amongst the commanders of government and the captains of capital by the early 1980s and were able to start fully unleashing their fury on the world after the test run of General Augusto Pinochet’s dictatorship in Chile during the 1970s. This neo-liberal script is a form of what Karl Marx termed “primitive accumulation”, and what David Harvey calls “accumulation by dispossession”, and is becoming popularly known via the works of Naomi Klein as “disaster capitalism” and the “shock doctrine”. A key ideological and strategic tool of this neo-liberal script is the concept of “humanitarian interventionism.” Despite how well intentioned this concept sounds, it is a tool developed through the auspices of NATO, under the guiding hand of the US government, to be executed through the UN to allow the imperialist powers to legally and morally interfere in the domestic affairs of weaker nations. Stated plainly, it is colonialism dressed in fine linen. As a practice it gained legitimacy after the imperialist induced atrocities in Rwanda, Burundi, and the former Yugoslav republic in the 1990’s to allegedly put an end to crimes against humanity such as ethnic cleansing and genocide. In the wake of these atrocities the UN under the direction of the US and its European allies has executed the doctrine of humanitarian intervention in all of the aforementioned countries and the Congo, Iraq, Somalia, and Haiti. The latest imposition of humanitarian interventionism in Haiti was in 2004, after the US overthrow of President Aristide and the Lavalas government, allegedly to restore order and maintain peace. But, this cut was just a deeper penetration of the affliction of neo-liberalism imposed upon Haiti by US imperialism with the willing aid of Haiti’s own decadent ruling class beginning in the 1980’s under the regime of “Baby Doc” Jean-Claude Duvalier. The current US occupation (the third since 1915) of Haiti removes the mask of the UN occupation in place since 2004, and is promoted and (sadly) widely unquestioned, in the US and throughout the world, as a “humanitarian operation” allegedly to stabilize the situation in Haiti in order to provide quake relief – which is nothing more than a perpetuation of the long standing racist view of the US government that the Haitian people are incapable of adequately presiding over their own affairs. The fact is, with the advancements and refinements in the application of the “shock doctrine” stemming from the occupation of Iraq, the political transformation of Sri Lanka following the Tsunami of 2004, and the social and demographic transformation of New Orleans and the Gulf Coast following Hurricane Katrina in 2005, the US government and transnational capital are seeking to apply a “coup de grace” on the people’s movement in Haiti in order to clear the way to remake it as a neo-liberal paradise. The stakes at play in the US occupation couldn’t be much higher for the people’s movement and the working and peasant masses of Haiti. Under US military rule the overwhelming bulk of the international relief aid (materials and finances) is centrally controlled by a handful of relief agencies hand picked by the US and the UN, who along with elements of the Haitian elite, control who gets anything and when, and thus turned relief aid into a weapon of social and political control. The major ports of entry into the country and its main transportation arteries are under tight US control restricting people’s ability to organize and mobilize under the ongoing dire circumstances. Potential routes of refuge to the US via the sea and the Dominican Republic via land have been effectively closed and legally barred. 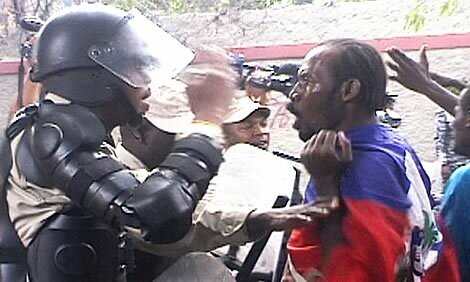 And the political repression unleashed after the liquidation of the Lavalas government in 2004 by the Haitian ruling class, former military and Tonton Macoute forces, and MINUSTA (the UN Stabilization Mission in Haiti) is intensifying, particularly with the ongoing banning of the Fanmi Lavalas Party from running in upcoming elections. And the hunting down by the US military and mercenary forces of political prisoners associated with the Lavalas movement and government, who were liberated by the collapse of several prison facilities during the January 12th earthquake. To top it all off, the Hurricane season is approaching rapidly, and no one, not the US military, the UN and NGO relief agencies, or the Haitian government is prepared to face it and the potential calamities it could bring, particularly as it relates to further displacement, the deepening of food insecurity, and the spread of infectious diseases. And these are just the short-term issues posed by the US occupation and the militarization of the relief and reconstruction effort. The long-term issue is the suppression of the people’s movement for self-determination and the imposition of permanent structures of dependency and subservience that the US government and the transnational ruling class are seeking to impose via a prolonged occupation. US imperialism is seeking to do no less to Haiti than it did with the occupation of 1915 – 1934, and that is to remove the threat of social revolution in Haiti and rebuild the Haitian military to serve as a repressive instrument against it in the service of transnational capital. 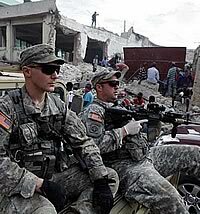 The US occupation of Haiti is not just a singular containment initiative. It is also an initiative to further the rollback of progressive social transformation that has swept large parts of Latin America and the Caribbean since the late 1990’s. The first major rollback initiative under Obama’s command was the Honduran coup that successfully ousted President Manuel Zelaya. The second, albeit with far less US intervention, was the election of a right wing government in Chile, under the leadership of billionaire President Sebastian Pinera. The occupation of Haiti is the third and by far the most deeply penetrating of these rollback initiatives. With it US imperialism is seeking to contain initiatives like ALBA, which in English translates into the Bolivarian Alliance for the Peoples of our America, initiated and principally led by Venezuelan President Hugo Chavez as an alternative of the FTAA. ALBA, through the solidarity initiatives of the Cuban and Venezuelan governments, was making significant headway in Haiti prior to the earthquake with the creation rural hospitals and schools and the provisioning of subsidized oil and low-interest development loans. Under the US occupation these initiatives are being stunted and contained in their growth. The greatest rollback threat however, is the occupation itself. It is a stark reminder to the aspiring progressive governments and social movements in Latin American and the Caribbean that as far as US imperialism is concerned the Monroe Doctrine is still in full effect over its historically claimed “backyard”, and that there are limits to the progressive reforms it is willing to tolerate. Solidarity and Joint Struggle: What is to be done? The US occupation is not just a problem for Haitians, and social movements in Latin America and the Caribbean, it is and must be understood as a problem for the progressive social movement within the US itself. Sadly, the Black Liberation Movement (BLM) has been divided and largely demobilized in relation to Haiti since the 2004 coup, in large part due to differences over how to view, understand, and relate to Fanmi Lavalas and President Aristide. Many have succumbed to accepting the grave distortions and outright lies perpetuated by the US government and right wing and ultra-left Haitian forces against President Aristide, Fanmi Lavalas and the Lavalas Movement. This position ignores the popular will of the Haitian masses and distorts the significant contributions of the Lavalas movement and government towards the realization of a participatory democracy and a people-centered path of economic and social development as an alternative to neo-liberalism. Similar dynamics have also occurred within Caribbean and Latino social movements within the US. And for the most part Haiti and the UN, and now, US occupations hardly register at all within the largely white dominated anti-war movement (gaining even less attention than the ongoing occupation of Palestine). Undoubtedly, racism, particularly the long-standing specter of the Black hoards of Haiti, is at play in this sad scenario. This situation must change, and the varied forces of the Black Liberation Movement must lead the way. The Haitian masses and popular movement without question are and will continue to fight valiantly to end the US occupation, but they cannot be left to fight on their own. It is incumbent upon the forces of the Black Liberation Movement to organize a multi-national and/or racial anti-imperialist initiative and coalition within the US that fights for the immediate end of the US occupation and the neo-liberal impositions it seeks to impose. The initiative must also take a committed stand in support of the demands of the Haitian popular movement that call for the return of Aristide, freedom for political prisoners, reparations and restitution (particularly from France for the brutal Indemnity imposed in 1824), and the cancellation of foreign debt and the negation of their structural adjustment conditionalities. In short, we must seize the opportunity to create our own script to counter neo-liberalism and humanitarian interventionism in support of the people’s struggle for self-determination and sovereignty in Haiti. This initiative must be conceived as one of joint struggle–one that is clear on the mutual and reinforcing self-interests of the social movement in Haiti, with its peasant and working class base, and the social movements in the US, and their multi-national, working class base, in the context of the ever increasing interrelated and interdependent capitalist world-system we live in. Our actions should not be contingent on charity or (worse) pity, but a firm grasp that as the social movement in Haiti goes, so goes the potential for the social movement in the US, for the allowance of one tyranny is the spawn of a hundred more. As we gather our forces to support the resistance of the Haitian people, and join with it in common struggle against imperialism, we will appear as a new defiant spirit and a force to be reckoned with. Kali Akuno is based in Atlanta, GA and works as the Director of Education, Training and Field Operations at the US Human Rights Network (USHRN) and is in the process of writing a book about his experiences organizing in New Orleans and the Gulf Coast after Hurricane Katrina tentatively called “Witness to a Cleansing”.